A Dedication to Nelson Mandela was read out before the concert. "Ladies and Gentlemen. Tonight, we would like to dedicate our performance of Haydyn's "Missa Brevis Sancti Joannis de Deo" (Little Organ Mass) to the memory of Nelson Mandela in honour of his achievements for Justice and Equality across our world. Thank you"
The members of Inverurie Choral Society are pleased to announce that shortly they will be offering everyone the chance to enjoy popular music from shows which have stayed in the public’s mind. The performance of “Songs from the Shows” will take place at Inverurie Academy on Saturday 4th June 2011 at 7pm. The event will mark the full return of Musical Director Moira Hunter in leading the choir after being indisposed. 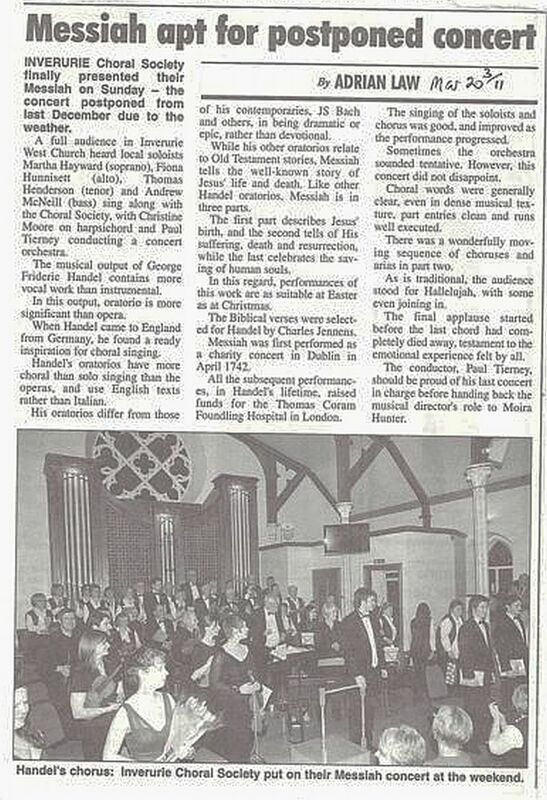 It also follows the extremely well received recent performance of the Messiah at the Acorn Centre in March. When the members were discussing what to include in the show it was clear that they wanted really memorable and popular songs from recent as well as more distant shows. What is amazing is that there are so many songs from the 40s through to the 90s which seem as fresh today as they were when first sung on Broadway and other theatre stages. Songs from such innovative US shows like Oklahoma, South Pacific and West Side Story are matched with The Sound of Music, and My Fair Lady from this side of the Atlantic. Then items from the King and I, Call me Madam and State Fair will offer the chance for some nostalgia. There will also be that great finale to Carousel, You’ll Never Walk Alone, which has been adopted by football fans everywhere. The choir will be singing that fabulously moving song Can You Hear the People Sing from Les Miserables. What is certain that those who do come to our celebration on June 4th will leave with some of the best tunes in 80 years birling happily around inside their heads. The Choral Society are pleased that they will be joined by soprano Anna Hamilton and tenor Martin Rudge. The price is £8.00 concession(£7.00) with any children of school age welcome free when accompanied by a paying adult. Tickets are obtainable from any Choir Member or at the door on the night. There will be refreshments available. 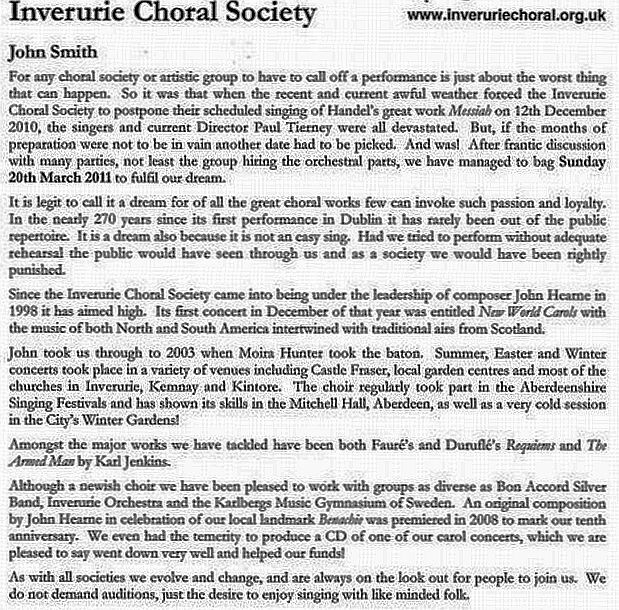 Inverurie Choral Society finally presented their Messiah on Sunday - the concert postponed from last December due to the weather. A full audience in Inverurie West Church heard local soloists Martha Hayward (soprano), Fiona Hunnisett (alto), Thomas Henderson (tenor) and Andrew McNeill (bass) sing with the Choral Society, with Christine Moore on harpsichord and Paul Tierney conducting a concert orchestra. The musical output of George Frideric Handel contains more vocal work than instrumental. In this output, oratorio is more significant than opera. When Handel came to England from Germany, he found a ready inspiration for choral singing. Handel’s oratorios have more choral than solo singing than the operas and use English texts rather than Italian. His oratorios differ from those of his con-temporaries, JS Bach and others, in being dramatic or epic, rather than devotional. While his other oratorios relate Old Testament stories, Messiah tells the well-known story of Jesus’ life and death. Like other Handel oratorios, Messiah is in three parts. The first part describes Jesus’ birth, and the second tells of His suffering, death and resurrection while the last celebrates the saving of human souls. In this regard performances of this work are as suitable at Easter as at Christmas. The Bibli-cal verses were selected for Handel by Charles Jennens. Messiah was first performed as a charity concert in Dublin in April 1742. All the subsequent performances, in Handel’s lifetime, raised funds for the Thomas Coram Foundling Hospital in London. The singing of the soloists and chorus was good and improved as the performance progressed. Sometimes the orchestra sounded tentative. However, this concert did not disappoint. 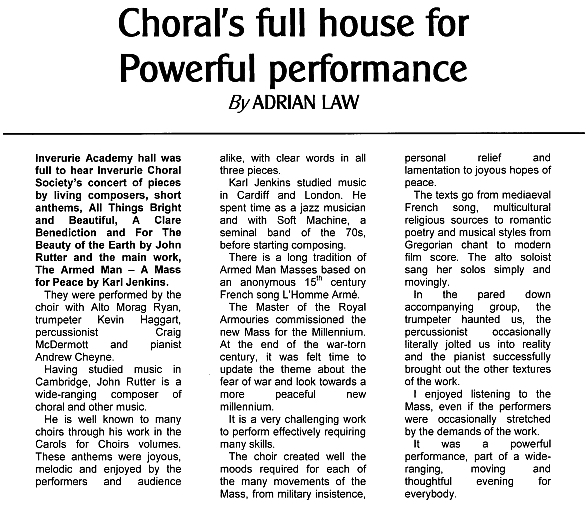 Choral words were generally clear, even in dense musical texture, part entries clean and runs well executed. There was a wonderfully moving sequence of choruses and arias in Part Two. As is traditional, the audience stood for "Halleluiah", some even joining in! The final applause started before the last chord had completely died away, testament to the emotional experience felt by all. The conductor, Paul Tierney, should be proud of his last concert in charge before handing back the Music Director’s role to Moira Hunter. IN what is probably its most ambitious concert yet, the Inverurie Choral Society’s will shortly tackle one of the greatest and popular choral works of all. They will sing Georg Frederick Handel’s “Messiah” on Sunday, December 12, at the Acorn Centre, West Church, Inverurie. Directed by Dr Paul Tierney and with several guest singers taking on the principal roles as well as supporting the regular members of the Society, the Inverurie based singers have been hard at work most Wednesday evenings since late August. The work is familiar to many in the choir though not all. For those who are new to Mr Handel’s great work it has been a tremendous exercise. Though many of the airs are familiar such as the Hallelujah Chorus, the techniques which the various parts of the choir have to master are less well known, and can be quite complicated and intricate. 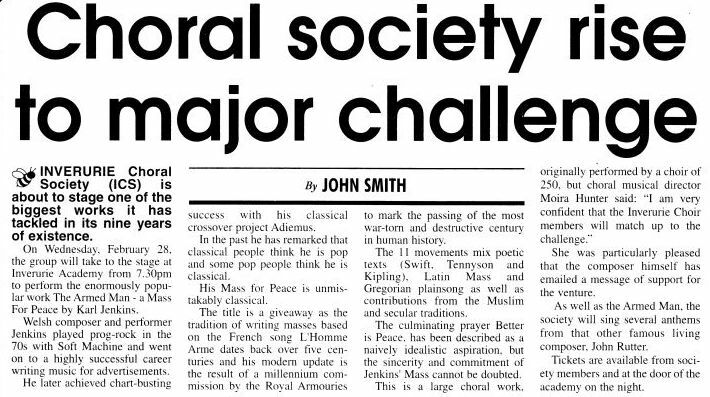 This then is the challenge, but the members of the choral society hope that they are up to the task. It is said that the addiction to choral societies has been a peculiarity of the British. When Handel arrived on these shores he found it a hotbed of polyphonic singing. This gave him considerable stimulus in composing oratorios and he always gave the lion’s share of the action to the chorus, unlike in opera where the chorus is usually subordinate to the action. The Messiah is considered by many to be his greatest work in this field, and he especially set his oratorios in the English language, rather than the fashionable Italian. The Messiah was first performed in April 1742 in Dublin. That it is still one of the most regularly performed says much of its attraction. The Inverurie Choral Society will he accompanied by Martha Hayward (Soprano), Fiona Hunniset (Alto), Thomas Henderson (Tenor) and Andrew McNeill (Bass), and musicians from Aberdeen University. The performance will commence at 7pm and the price is £10.00 (Children free if accompanied by an adult). Refreshments will be available, and tickets may be obtained from Morgan’s Music, Rose St, Inverurie, members of the Choral Society or at the door on the night. INVERURIE Choral Society is set to celebrate its tenth Anniversary with a concert planned for Inverurie Town Hall on Saturday, June 7. Among the attractions on the night will be a new work "Bennachie" which has been specially commissioned for the event by Dr John Hearne who was the first Musical Director of the society. Over the years the company has challenged its members with many difficult works by modern composers as well as a whole ranged of acknowledged classics. The first concert was held at Inverurie Academy and was centred on music from South America and the guest soloist was Aberdeenshire's own Gillian Taylor. Gillian Jack, as she now is, remains a great favourite in the North east performing opera at places such as Haddo. She will be taking the soprano role in John Rutter's "Magnificat". The Society has made a point of supporting and taking part in the yearly Aberdeenshire Singing Festivals, earlier this year at the Stonehaven event the Choral society sang an African Chorus "Hamba Lulu" with the massed choirs to considerable acclaim. 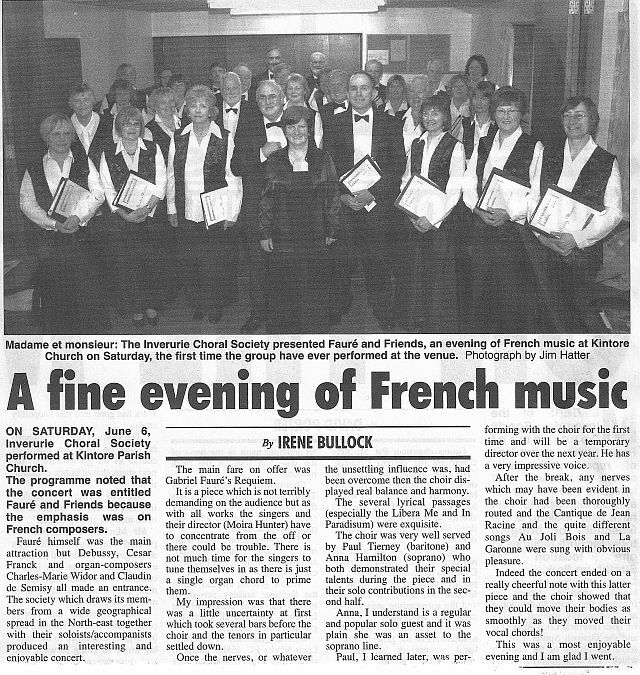 The Society has sung at venues as varied as Castle Fraser, Marischal College and the Inverurie Garden Centre as well as many churches and centres in and around Inverurie, the Christmas concerts have been particularly popular, and well known music reviewer Alan Cooper reported that the Choir "strikes gold in chapel" following the performance at Chapel of Garioch in 2000. Over the years there have been many highlights, such as performing Karl Jenkins "The Armed Man" in 2007 and sharing the stage with the young singers from the Karlsberg Music Gymnasium from Sweden the previous year. Scottish music has not been ignored and Burns and others have been well represented over the decade in the repertoire of the Choral Society. Current Musical Director Moira Hunter is excited at the forthcoming concert and the venue saying: "I feel that Inverurie Choral Society has made its mark on the musical map of the North east and I am certain the choir will provide a fantastic musical treat for Inverurie folk." There will be a pre-concert talk by Dr Hearne between 6.30 and 7pm on the night and the performance will begin at 7.30pm, with those attending having the opportunity to hear many of the favourites of the past ten years. Inverurie Choral Society are gearing up for the presentation of their first substantial event of 2006, a major work by Durufle. Durufle's Requiem will be the central piece in a concert at Inverurie's West Church on Sunday February 5 at 7.30 pm. Maurice Durufle (1902 - 1986) was a very important 20th Century composer and his Requiem (composed in memory of his father) is considered to be one of his most important pieces. The influence of the Church on his music stems from his time as a student at Rouen Cathedral and Gregorian Chants are in evidence as well as sublime and ethereal moments which are quite dream-like. The work is not particularly long, but is testing for the performers. 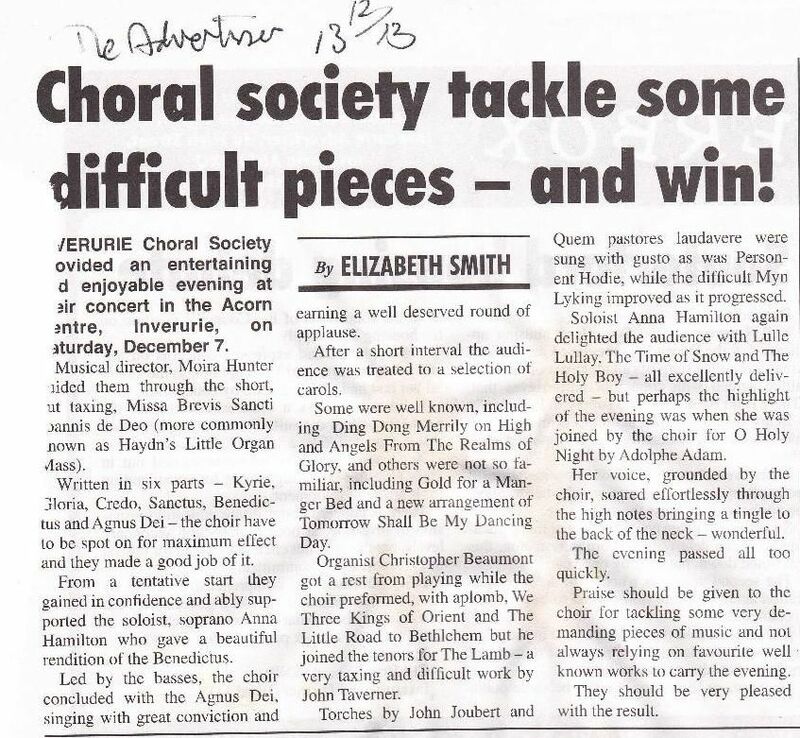 Musical Director Moira Hunter said "We hope that Durufle will please our audience and that together with the supporting items they will go home after the concert well satisfied." The Inverurie Choristers have as their soloists Gordon Jack, Tracey Stewart and organist Donald Hawksworth (George Chittenden substituted Donald - webmaster) and will be supported by some of the Simpson Singers and guest singers from Aberdeen University. As well as Durufle, the choirs will sing an original setting by Paul Halley (former organist at New York's Cathedral of St John The Divine) of the 13th century hymn Jesu, The Very Thought of Thee. There will also be a number of solos by the guest singers and the popular Mozart work Ave Verum Corpus (K618). The Inverurie Choral Society enjoyed a busy Autumn season, having performed at Marischal Hall in Aberdeen with the Bon Accord Brass Band, Castle Fraser and at the Inverurie Garden Centre where they put on carol concerts. As well as the coming performance they will be taking part in the Aberdeenshire Choir Festival in March and will have a summer concert in June with the theme A Trip Around Europe. 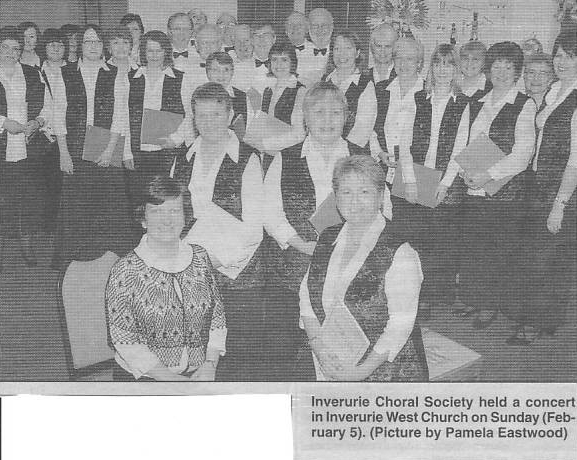 Inverurie Choral Society will launch a new season of recitals at the weekend with a concert in the town's West Church. They will perform Durufle's Requiem from 7.30 pm on Sunday. The work written in memory of Durufle's father is recognised as one of the 20th Century composer's finest pieces.Durufle, who died in 1986 at the age of 84, studied at Rouen Cathedral in France and his work reflects the tradition of Gregorian chants and traditional church music. Soloists will be Gordon Jack and Tracey Stewart and organist George Chittenden, who plays at St Andrew's Cathedral in Aberdeen. They will be aided by members of the Simpson Singers from Aberdeen University. Also on the programme will be a setting of a 12th-century hymn by Paul Halley, who was a cathedral organist in New York, and works by Faure and Mozart. Inverurie Choral Society recently performed at Marischal College in Aberdeen and at Castle Fraser, near Kemnay/ Next month, the group will join in the Aberdeenshire Choir Festival. 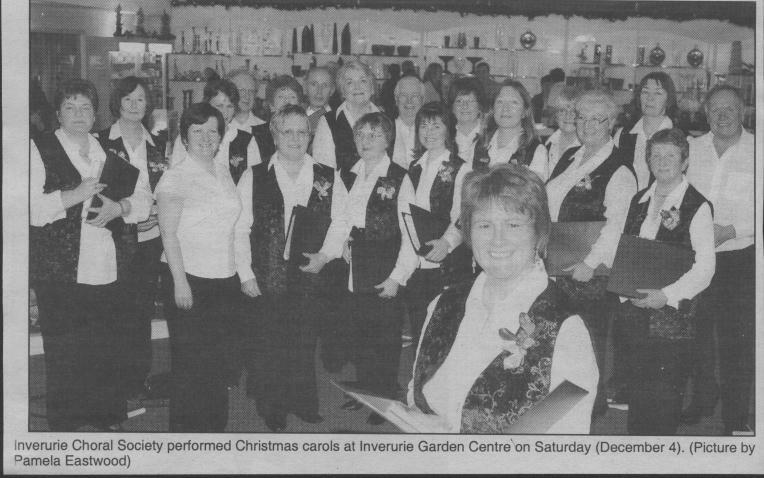 This picture appeared in the Inverurie Herald after the Choral sang Christmas Carols at Inverurie Garden Centre. We have been asked back to sing again the Saturday before Christmas. A concert with a difference is the promise from the Inverurie Choral Society when it presents its Annual Christmas concert at St Andrews church, Inverurie, on Sunday (December 14th). Under its new director Moira Hunter the choir will be taking music from each of the last seven centuries and bringing them into most modern times. Not only is the Society going back to its own very traditions - for several years it presented a very popular carol concert - but by going back to the to the very roots of Christmas singing, to the 1300s, it is offering the public the chance to hear how the season was celebrated in the middle ages. The songs and airs are remarkably easy on the ear. Choral singing as a tradition has involved not only different styles of music and many different instruments but it has been popular in many different countries. The Inverurie Choral Society is not only singing in modern English and of course giving the chance to its audience to join in to sing some of the most popular carols of today, but it's testing its ability to sing in old German, French and Latin! The centre piece of the concert will be Haydn’s Missa Brevis, or the Little Organ Mass. This is an engaging and testing piece which the choir has been practicing since September. Guesting with the choir on this occasion will be Anna Hamilton, a very popular soprano who has worked with conductor Moira Hunter on many occasions in opera on the stage of His Majesty’s Theatre. The choir is excited that Anna is joining them. The accompanist will be seasoned regular Donald Hawksworth. Chapel of Garioch was the venue for Inverurie Choral Society's summer concert on Saturday. Entitled "A Summer Schubertiad", the choir, which celebrates its five years of existence this year, gave a resounding vote of confidence to the works of Franz Schubert and a few of his contemporaries. Conductor John Hearne picked Schubert's Mass in G as the main offering from the choir which was sung in Latin with the soloists provided by the Aberdeen Vocal Ensemble. The concert also included some more readily recognisable pieces including Schubert's composition for the 23rd Psalm and an extract from the German Mass. Mr. Hearne, who was conducting the choir for the final time, introduced several of Schubert's songs to the audience. Songs of love and dance, of the sea and of sorrow, showed off the breadth of the master's skill. That the choir had to sing a cappella and several in the Old German language, gave them a chance to demonstrate their skills. The accompanist on the piano and organ was Donald Hawksworth. Sharing the stage with the ICS was the Aberdeen Vocal Ensemble (AVE) - a group of ten students directed by Brian Gunnee who sang Schubert's Der Schnee Zerrint after Mendelssohn's Hear My Prayer. The soloist was Laura Morley. 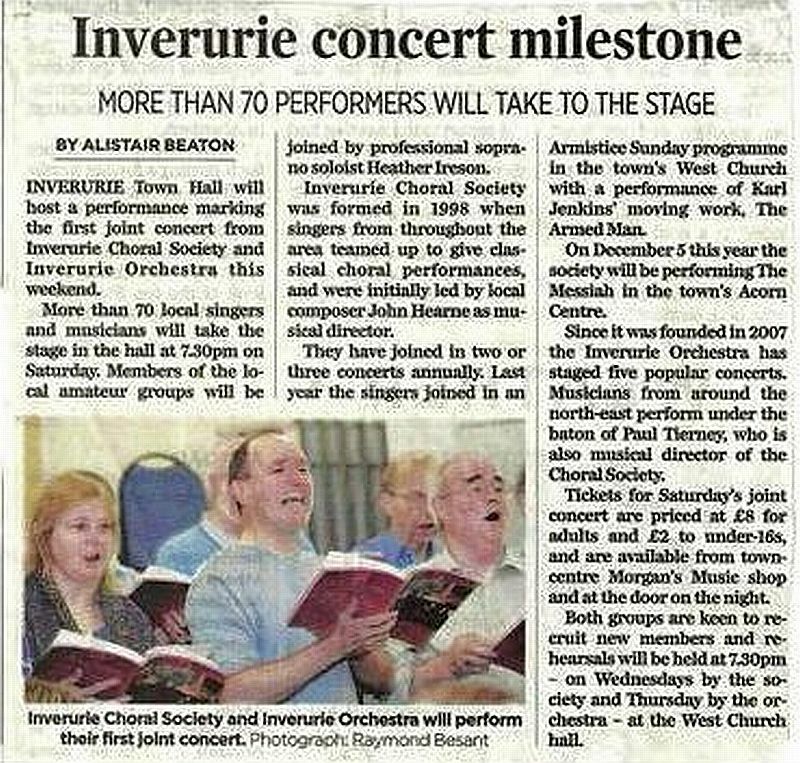 John Hearne, who had taken up the baton for Inverurie Choral Society, will not be lost to the area. He is currently rehearsing a combined choral group including Haddo and ICS for a major performance of Elgar's Gerontius to take place on November 30 as a tribute to Lady Aberdeen, His place at ICS will be taken by Moira Hunter, lately the conductor of the Aberdeen Opera Society. Prior to the concert ICS Chairman Douglas Harper of Monymusk presented John with a music stand as a thank-you gift from the Society. 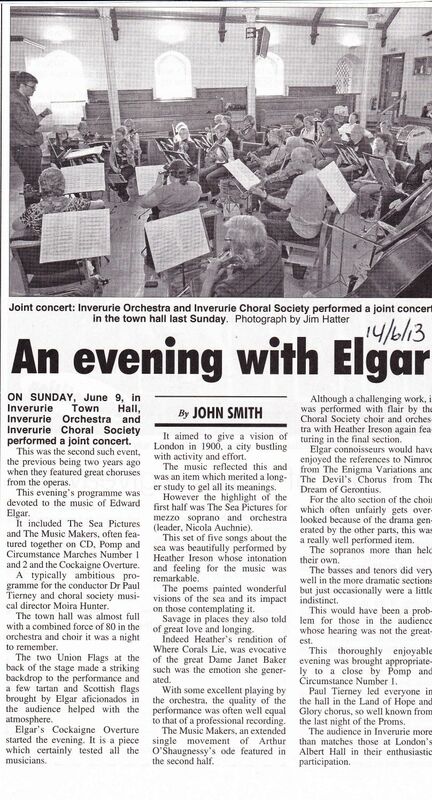 Inverurie Choral Society and their conductor John Hearne successfully married two different musical traditions at their concert in Chapel of Garioch on Saturday (29/6/02) night. The special guests of the choir this year were a group of four fantastic young musicians who cam from Inverurie Academy - three fiddlers and a pianist - who made up the Celtic folk band Celtacad. The fiery attack of their playing and their evident enjoyment put a fizz into a programme of choral favourites which ran from Thomas Morley's madrigal April is in my Mistress's face to Elgar's As Torrents in Summer or Sullivan's The Long Day Closes, a splendid piece of Victoriana and all beautifully performed by the chorus. Along with these standards of choral repertoire expected from John Hearne there was imaginative programming, such as a revival of Dr Callcott's amusing setting of the May Fly. There was also an immaculate performance of Massenet's Meditation from Thais. Just a few ingredients of a wholly delightful evening in a picturesque setting. The Way We Sang Then was the title of last night's concert by Inverurie Choral Society conducted by John Hearne in Kemnay Church Centre. Billed as a visit to an early Victorian Glee Club. John Hearne had unearthed a wealth of wonderful music some of which had hardly seen the light of day for more than a century and a half - music by Scottish composers like John Thomson, Scotland's first professor of music at Edinburgh and Sir George MacFarren. In fact, Mr. Hearne ended up contributing more to the evening than he had intended. Guest soloist Jamie MacDougall had flu so John took his place. The choir were in top form and with solo songs by Schubert sung by John Hearne, it all added up to an evening of pure delight. 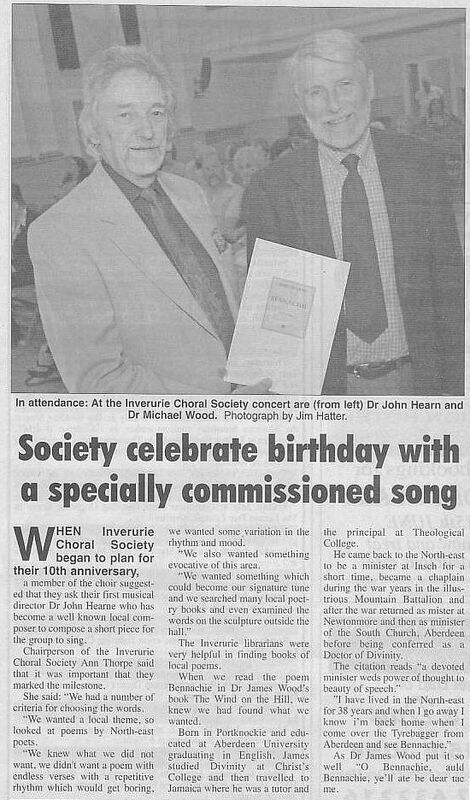 Inverurie Choral Society singers whisked themselves back in time last Wednesday (13th March 2002) evening as songs from the early 19th century were revived. 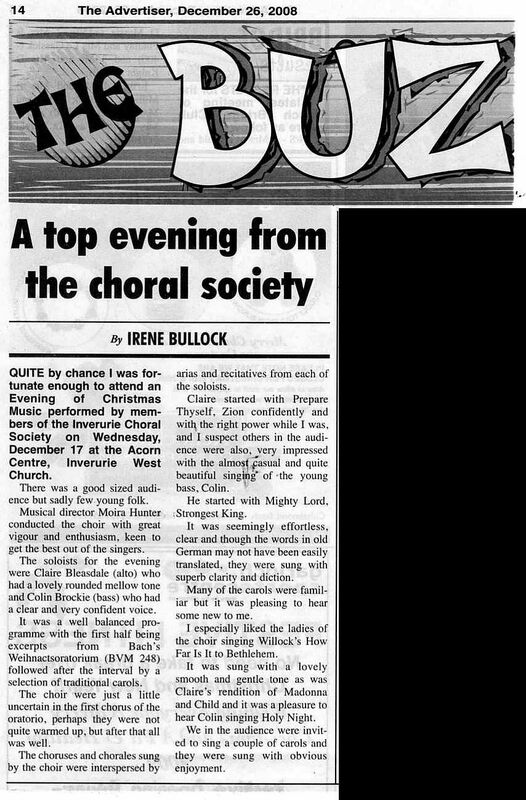 The Society presented a programme described as a visit to an early Victorian Glee Club, at Kemnay Church Centre where The Way We Sang Then was performed in front of an appreciative audience. The chorus sang a number of "glees" which are short choral pieces of the type enjoyed by members of the singing clubs of the early 19th century in England and Scotland. Several of them were amusing and jocular; others sentimental and romantic. One was a very significant piece written in 1836 by John Thomson and performed at a dinner of an Edinburgh Society of Musician. Ably stepping into the shoes of the unavailable guest artiste tenor Jamie MacDougall, was John Hearne, who in addition to being a conductor and composer, is also a professional singer. Mr. Hearne performed a similar programme to that originally planned. Guest artistes on the night were the clarinetist Colin Hunter and pianist Robert Howie, who are well-known musicians from Aberdeen. 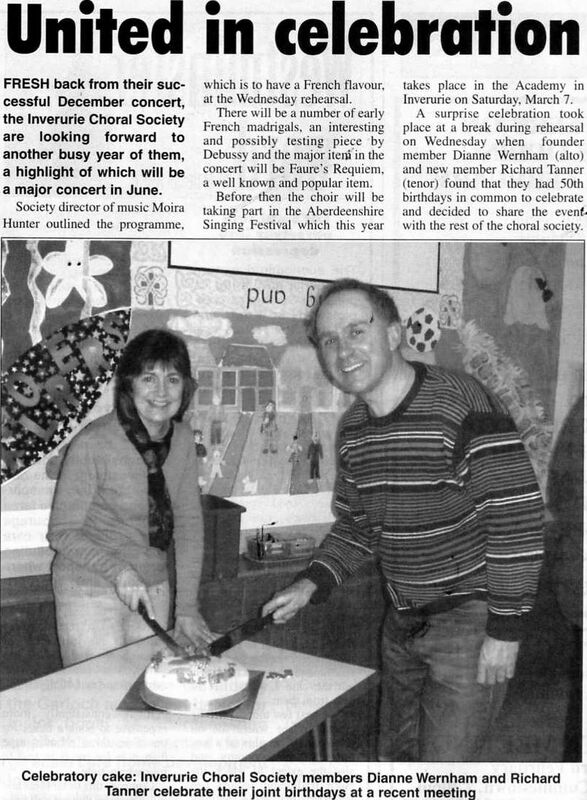 Inverurie Choral Society was formed in 1998 in response to requests from many people who wanted to sing choral music from the classical repertoire, and the society gave its first concert in December 1998, and a summer concert in June 1999. 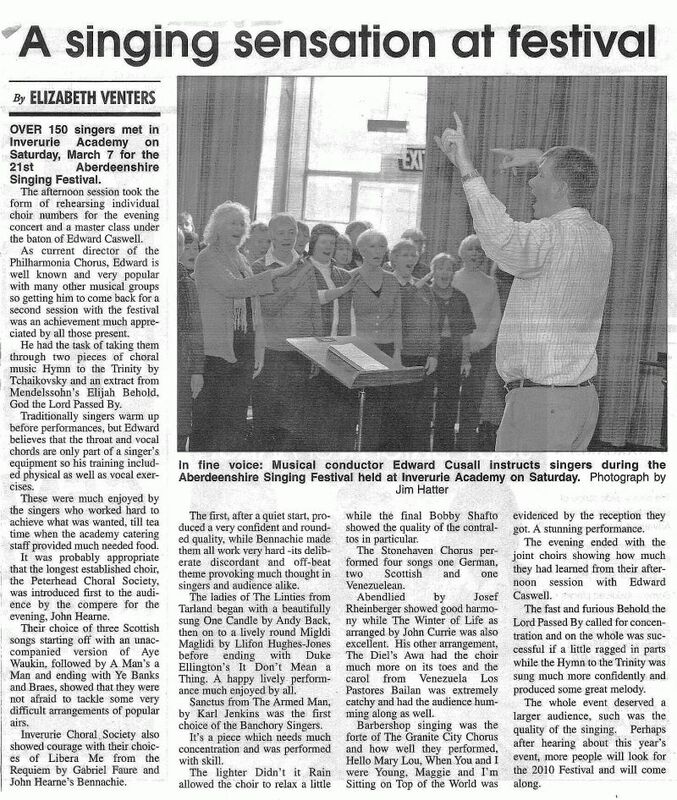 Songs from the early 19th century will be revived by Inverurie Choral Society at a concert next week. 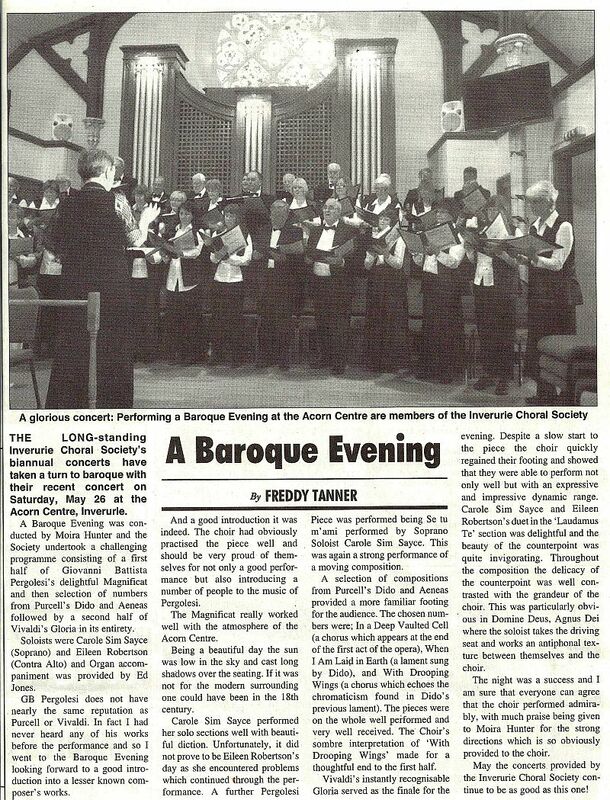 The society is presenting a programme described as a visit to an early Victorian Glee Club, on Wednesday March 13th at Kemnay Church Centre at 8.0 pm. The chorus will sing a number of “glees” which are short choral pieces of the type enjoyed by members of the singing clubs of the early 19th century in England and Scotland. Several of them are amusing and jocular; others are sentimental and romantic. One is a very significant piece written in 1836 by John Thomson and performed at a dinner of an Edinburgh Society of Musicians. Guest artists are the tenor Jamie MacDougall and the clarinetist Colin Hunter, accompanied by pianist Robert Howie. Jamie will be familiar to Radio Scotland listeners for his Sunday afternoon broadcasts and as a very popular soloist and an opera singer with an international career. He will be singing Lieder by Schubert and Mendelssohn and two rarely heard songs by the Scottish 190th century composer George MacFarren, which are accompanied by clarinet and piano. Colin Hunter and Robert Howie are well-kent musicians from Aberdeen. The concert on Wednesday will last for just over one hour and refreshments will be available afterwards. Tickets are available from Leonards Music, Inverurie, or at the door on the night. Patrons are advised to leave cars in the street below the church centre as parking space is limited. All reports reproduced from the Press & Journal with their permission. Around 300 choir singers from throughout the North East converged on Inverurie Academy to take part in the Aberdeenshire Singing Festival. The 10th annual event was the biggest so far. It attracted 10 of the North-east's top choirs, including 2 youth choirs, and groups from Stonehaven, Inverurie, Aberdeen, Banchory, Peterhead and Ellon. A capacity crown of around 300 parents, relatives and friends of those taking part turned up to watch a concert on Saturday night. It featured short individual performances from all of the choirs before they joined together for a massed finale that demonstrated skills learned from an afternoon-long workshop led by Edinburgh-based conductor Ben Parry and previous practice sessions. Aberdeenshire Council Arts Development Officer, Sheila Waterhouse explained the non-competitive element of the event. She said "It is help purely for the joy of people singing together. It started off as a Deeside Singing Festival and then Aberdeenshire Council promoted it when it came into existence and turned it into the Aberdeenshire Singing Festival. It travels around Aberdeenshire and we have held events in Aboyne and Stonehaven and last year's event was in Fraserburgh." Festival music Director, John Hearne said the event was a big success. 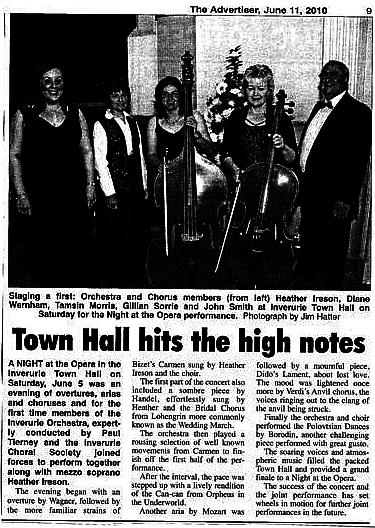 "They were so different from each other - it was a terrific variety, "he said, "it was a wonderful opportunity for all these people from different places and of all ages"
The first ever concert given by Inverurie Choral Society drew a big crowd to Inverurie Academy hall on Saturday night. Through his work with the Stonehaven Chorus their conductor, John Hearne, has established a reputation for unusual and adventurous programming especially at Christmas. Saturday's debut performance was no exception. New World Nowells took six carols by the South American composer Ariel Ramirez and interspersed them with carols from England, Scotland and Canada to tell the entire Christmas Story. Guitarist David Bracegirdle contributed a couple of intimate guitar solos, and soprano Gillian Taylor, delighted with two striking solo spots. The enthusiasm and fervour of the choral singing put across all the rhythmic excitement and co lour of the South American carols, and although the choir does need a few more men, they impressed me with the Scottish carol, Balulalow, and its striking unusual melody, and within their performance of the Red Indian Huron Carol from Canada. The recently-established Inverurie Choral Society gave their first annual concert in the Inverurie Academy hall on Saturday night. It was an impressive start, although the choir really do need a few more tenors and basses for a satisfactory balance, and consequently there were one or two threadbare patches in the choral texture. Conductor John Hearne pulled off something of a coup by getting Aberdeen Sinfonietta as the support orchestra. Their performance of Honegger's Pastorale d'Ete was ravishing. Baritone Gordon Jack proved his worth as guest soloist with a delightful selection of English songs on which he was accompanied by Christine Bremner. Choir, orchestra and soloist opened the concert with Holst's Psalm 86, but the most captivating performances were the two larger items, the first of which was by John Hearne himself. Summer Nights in the Fjords is a setting for chorus, soloist and orchestra of four Icelandic folk songs. The orchestral writing was full of magical touches and the entire work painted a vision of the land of sparkling waters and midnight sun to perfection. Elgar's Scenes from the Bavarian Highlands also featured John Hearne's skills as an orchestral colourist in his new arrangement for wind quintet and strings. That work had the best moments of choral singing, too, as the choir really grabbed hold of Elgar's joyful melodies. When they got Baritone Alan Watt as guest soloist for their Spring Concert in the delightfully intimate Chapel of Garioch on Saturday night, Inverurie Choral Society struck gold. Much of their performance centered on his beautifully smooth singing, with solos like I bought Me a Cat from Three American Songs by Aaron Copland, and Lord God of Abraham from Mendelssohn's Elijah, both in different ways highlights of the performance. With David Smith at the organ and the Choir providing richly coloured backing, Alan Watt carried the melodies of Vaughan Williams' soaring settings of George Herbert's texts warmly and confidently. The Choral Society still needs more men, especially tenors, to achieve a completely satisfactory balance but their series of secular songs from Scotland and France were nicely drawn and the two of Grieg's Four Psalms which they performed were first class. Conductor John Hearne included two of his own compositions, the beautiful anthem At Close of Day and The Seagull in which the sopranos sing an old Skye folk song while the rest of the chorus provide atmospheric sounds of the sea and seabirds. It was a startling idea that worked remarkably well.